A custom API in a mobile service is a function that your client apps can call. See Custom API. When you work with mobile services in Visual Studio, you can add a custom API and edit it in Visual Studio. 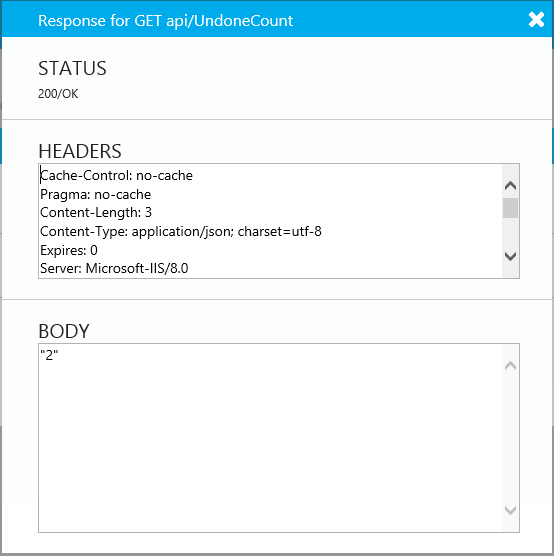 A custom API is created as an HTTP endpoint in the form of a REST API. 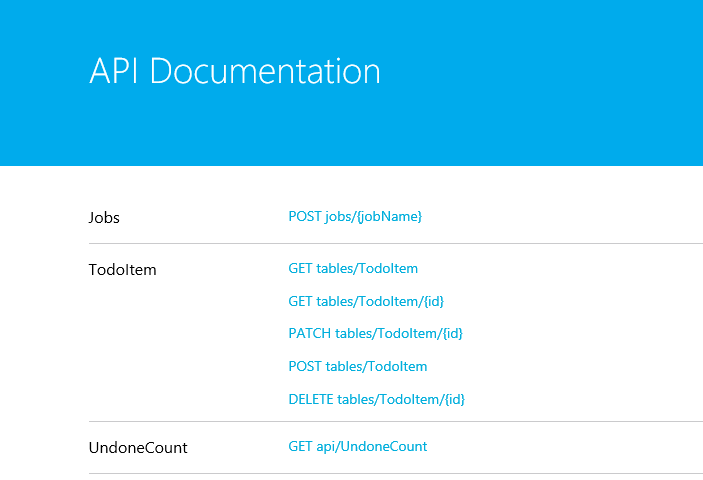 Examples of using custom APIs are to return data from a query, and to make updates to a database that require more processing than is possible in a simple update script, or involve more than one data table. A mobile service .NET backend project in C# or Visual Basic, and a client project to call the API, such as the result of completing this quickstart. In Solution Explorer, open the shortcut menu and choose Add > New Scaffolded Item. 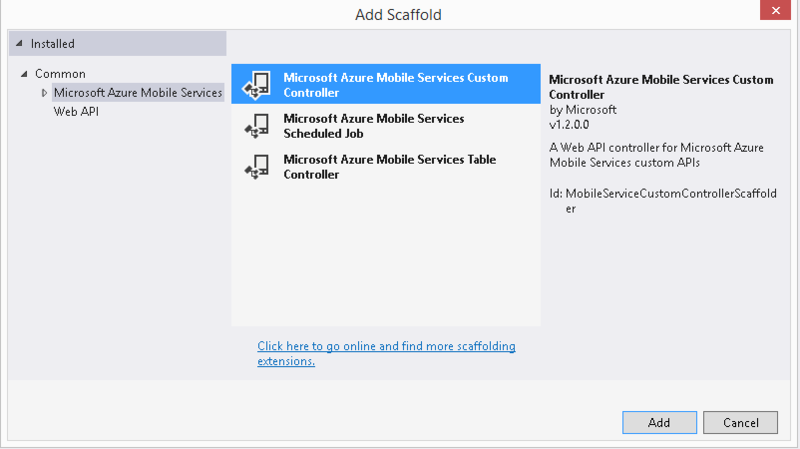 In the Add Scaffold dialog box, choose Mobile Services Custom Controller. In the Add Controller dialog, enter a name for the custom API controller, and choose the Add button. The name should end in Controller. A file is added to your project that contains the code for the controller, with a built-in HTTP method. You can now write code for your custom API. A custom API can include one or more of the HTTP verbs GET, POST, PUT, PATCH, or DELETE. Locate the name of the new API in the list, and choose the link for the GET method. Click try this out to run the custom API. When the api completes, you see the response. Insert code in the client app to call the custom API. You use the InvokeApiAsync method to call a mobile service. You need a class to hold the result. For the above example, the following type will suffice. For the example code above, your client code might look like this in the MainPage class. // Asynchronously call the custom API using the GET method. To complete this example with the sample project, edit MainPage.xaml to add a button that, when clicked, calls the above code. You can pass parameters to a custom API using a dictionary object that contains the parameter names and values as strings. The values must be strings but Web API attempts to convert parameters to appropriate types based on the declaration of the custom API. In this example, you'll add an API that you could use to send a todo list as an email when a user clicks on a button on the client. Add a new custom controller, called MailController, and add code in the Post method to send an email. You can use either Get or Post, depending on how you want to design your custom APIs. Include a parameter for the recipient's email address. For this example, you can just leave the SendMail method unimplemented, but later you can use the SendGrid email service in Azure to implement this method. Add client code to call the custom API. You use a Dictionary object to construct the parameters list. The key is the name of the parameter, as a string, and the value is the argument you are providing. Also, add a click event handler for a button you'll add to call this method with an example email address. 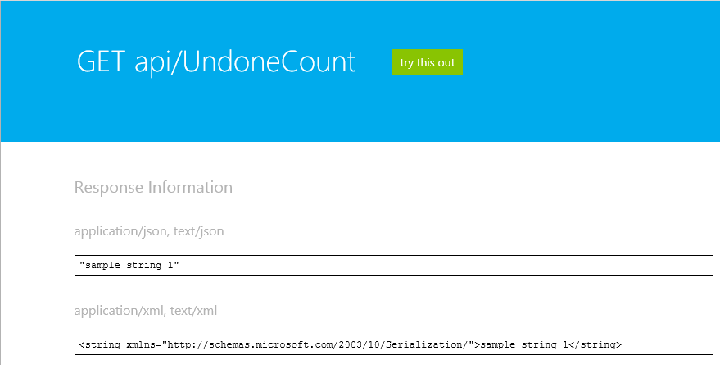 Add a button in XAML to let the user call the new code. Add this code before the last Grid closing tag to locate the button below the other UI elements. By default, an anonymous Internet user cannot access a mobile service methods unless they have the application key. This procedure shows how to change the authorization. You can use the AuthorizeLevel attribute to enable everyone to access the controller's methods, or to restrict permissions to authenticated users or administrators. See Get started with authentication in Mobile Services. Valid values of the AuthorizationLevel enumeration are Admin (administrators only), Anonymous (no restrictions), Application (requires the application key), and User (requires authenticated credentials). A scheduled job is a function that runs on the server according to the schedule you specify. It is a way to have code run on the server without being triggered by client apps. Select the project node for the mobile service project, and choose Add > New Scaffolded Item. 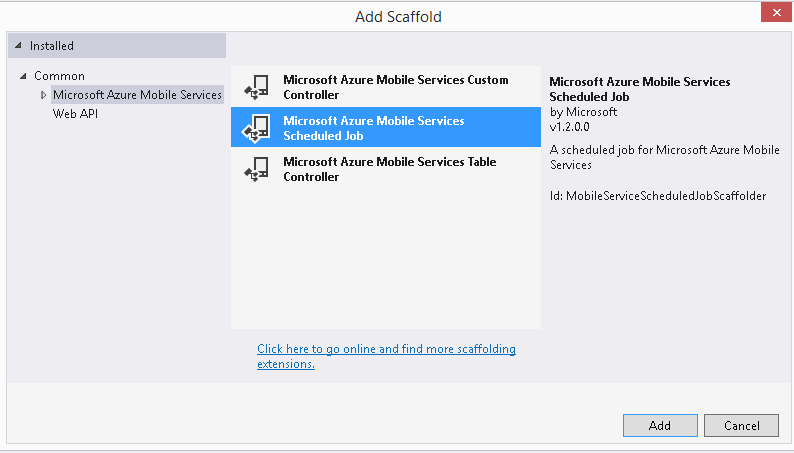 Choose Azure Mobile Services Scheduled Job, and choose the Add button. In the Add Scheduled Job dialog box, give the job a name, and choose the Add button. It must end with Job. Visual Studio adds a code file to your project in a folder called ScheduledJobs. Implement your job in the ExecuteAsync method. Or, as a test, simply edit the text that gets written to the log in the default implementation. Open the shortcut menu for the mobile service project, and choose Publish. Unless you want to change any of the settings you chose last time, choose the Publish button. Choose your service in Server Explorer, open the shortcut menu, and choose Open in Management Portal. In the management portal, choose your mobile service, and then choose the Scheduler tab. Choose the link to create a scheduled job. In the Create a new job dialog box, enter the name of the job that you entered in the Add Scheduled Job dialog box in Step 3, but omit the Job suffix. Enter how often you want the scheduled job to run and when to start. If you don't want to define the schedule now, set it to On Demand. Choose the checkmark to create the job. Enable the job by clicking on the Enable button. Test the job by clicking on the Run Once button. In Visual Studio, open the shortcut menu for the mobile service node in Server Explorer, and choose View Logs.